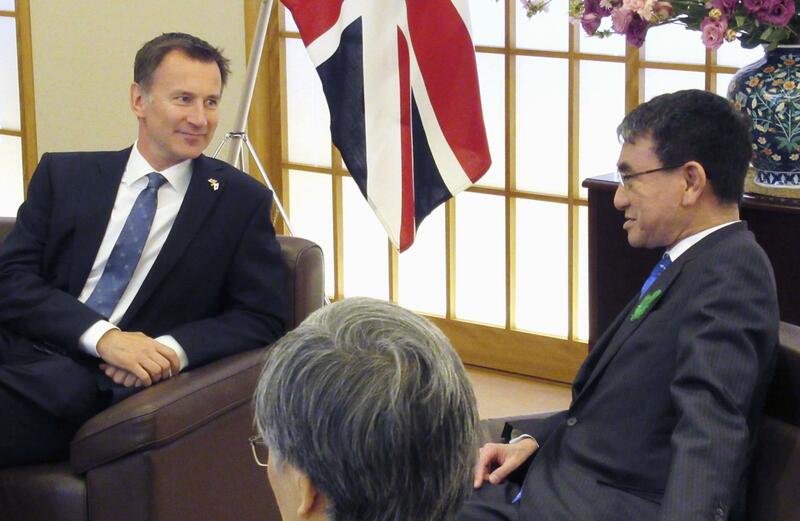 In a meeting Tuesday in Tokyo with U.K. Foreign Secretary Jeremy Hunt, Foreign Minister Taro Kono expressed a “strong hope” that Britain will make a smooth exit from the European Union and avoid a “no deal” Brexit. Because the recent impasse over Brexit has led to the postponement of bilateral ministerial security talks that were originally slated for April, Kono and Hunt agreed to set a new schedule for the “two-plus-two” meeting at an early date, the Foreign Ministry said. In their second face-to-face meeting in a month, Kono welcomed that a no-deal Brexit has been avoided “for the time being,” after the U.K. and the other 27 EU members agreed last week to extend the exit deadline from April 12 to Oct. 31. But Kono also asked Hunt to minimize the negative impact of Brexit on Japanese companies and the world economy. Hunt was quoted by the ministry as telling Kono that the U.K. is determined to avoid leaving the EU without an agreement, which could disrupt business activities. On Monday, Hunt reassured Prime Minister Shinzo Abe that a no-deal departure would be unlikely, and asked Toyota Motor Corp. Vice Chairman Shigeru Hayakawa to continue production in the U.K. even after Brexit, a source with knowledge of the matter said. The Japanese automaker is reportedly considering the possibility of withdrawing from production in Britain to prepare for a possible no-deal Brexit. Toyota, Nissan Motor Co., and Honda Motor Co. are among the Japanese manufacturers that have production plants in the U.K. Honda has announced it will close its Swindon factory in England in 2021, in the latest example of Japanese firms reviewing their business strategies to cope with uncertainty over Brexit. 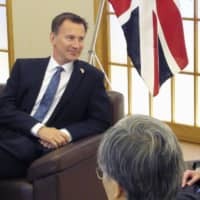 During a meeting in Tokyo on Monday, Hayakawa reportedly called on Hunt to avoid an exit by the U.K. without an agreement. According to sources, Hayakawa is believed to have expressed concern that if a no-deal Brexit becomes reality, the introduction of high tariffs between the U.K. and the EU would make it difficult for Toyota to continue operations in the country. Hayakawa is also believed to have asked the U.K. to pay due consideration to Toyota’s management. According to Toyota, the meeting was held at the request of the U.K. government. Toyota produces engines and finished vehicles at a British plant with parts and components procured from the EU and other places, and exports them to the EU and other destinations.